The above chart (Fig. 1) outlines how structured guidance is organised within the GSGS. More detailed information can be found in the Supervision Agreement. The Admission section gives information on what to do to become a GSGS member. As a member of the GSGS, you have to find one or two scientists besides your principal supervisor to be part of your doctoral committee within the first 2 months of your project. 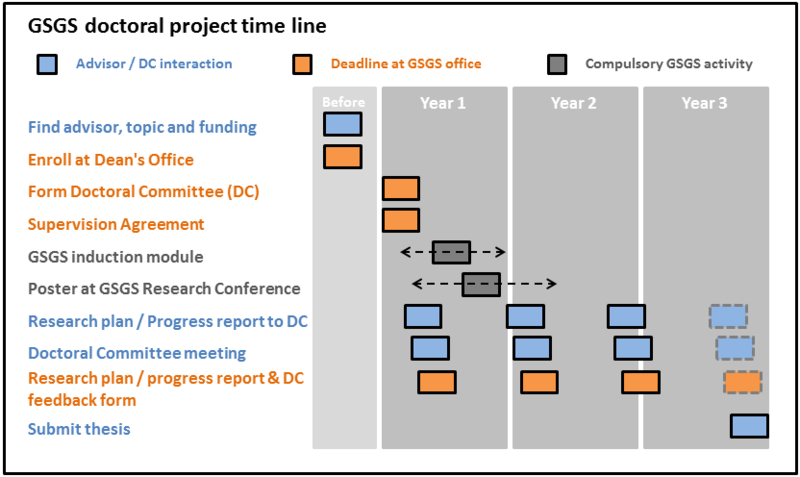 The doctoral committee (DC) will accompany you throughout your independent research phase. The co-advisors can but do not need to become the official examiners of your doctoral thesis. Involvement of external experts is encouraged. If a potential DC member would like know what they are getting in to before deciding, please feel free to point them toward this overview. Your principal supervisor (or "advisor") has to be a professor or Privatdozent legally entitled to supervise doctoral candidates in the Faculty of Mathematics and Natural Sciences, UoC. The other one or two doctoral committee member(s) are called “co-advisors”. a) Co-advisors must have a doctorate or PhD degree. 2) independent of your principal supervisor. The doctoral candidate and his/her doctoral committee (DC) members agree on and sign a supervision agreement (download to fill out) within the first 3 months of a candidate’s project. All members and the doctoral candidate get a copy; the original is kept in the GSGS Office. In principle, this agreement needs to be handed in with the GSGS office before any GSGS courses can be attended or funding can be applied for. By mutual agreement of the signatories, most parts of this document can be changed at all times. Doctoral candidate members of the GSGS have to submit a detailed research plan between 3 and 6 months after the start of their project. After that, a progress report is due every c. 9 months; each exact due date is fixed during the previous meeting. Unless agreed otherwise, doctoral committee members should receive the report at least two weeks before a planned meeting to give them time to read and comment it. Only if the doctoral committee members agree in advance, a progress report can be written in the form of a draft publication or given as an extended talk, where the doctoral committee members are present. Please consult the guidelines for reporting before writing your detailed research plan or progress report. Candidate and doctoral committee members meet at least once every 9 months. These meetings are initiated and organised by the doctoral candidate. Depending on the composition of the doctoral committee, joint or separate meetings can be held; also teleconferences are an option. The aim of the meetings is to discuss the planning and progress of the research project and any other important matters, and to identify any training needs. Some guidelines for doctoral committee meetings are provided here. The members of the committee read and comment on the detailed research plan and the progress reports, which are submitted to them at least two weeks before the meeting. They are further involved in decisions on important steps in the research project. The doctoral committee feedback form needs to be filled out and signed by each DC member for each meeting; for joint meetings this can be done jointly. A scan of all signed documents is to be sent to the GSGS office by the doctoral candidate along with a PDF of the report as soon as possible after the meeting and by the due date agreed on in the supervision agreement or in the previous feedback form. An induction module is organised several times per year. Every doctoral candidate member should attend it at least once. Besides introductory and general information about the GSGS, there will be sessions on issues such as good scientific practice, scientific ethics, data management and data storage.